Detectives from the Baltimore County Police Department made two arrests on Monday in connection with a shooting on Handworth Way in Nottingham (21236) that left one man injured on Sunday night. Police were called to MedStar Franklin Square Medical Center on Sunday evening after a man walked in with a gunshot wound to the lower body. The victim, 31, stated that he and his girlfriend were involved in an altercation with another couple at around 7:30 p.m. that led to the male suspect shooting him. The victim was treated at the hospital and released. 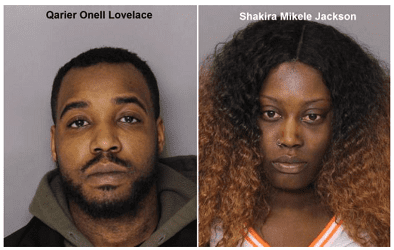 Police have identified the suspects as Qarier Onell Lovelace, 29, of the 1200-block of South Marlyn Avenue (21221), and Shakira Mikele Jackson, 31, of Handworth Way (21236). Both suspects have been charged with attempted first-degree murder, first-degree assault, and firearms charges. They are both being held without bail at the Baltimore County Detention Center pending a bail review hearing.